What is is that makes a series sustainable and interesting, book after book? That's something I've been talking about lately with a friend of mine, and what I think it boils down to is that the characters have to be strong and interesting enough to maintain reader interest, changing and growing as the stories continue. And what really helps is a cast of supporting characters that are complex and have interesting and changing relationships with the main characters. When all this is combined with stories that are interesting in and of themselves, typically with an element of mystery, then the series usually sustains my interest, book after book. The Chronicles of Elantra series certainly fits the bill. 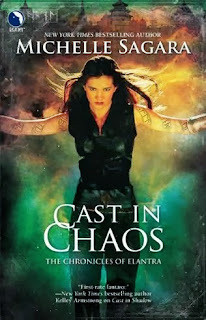 Cast in Chaos is the sixth book in the series, and I'm still hooked. Kaylin is interesting and complex, with a murky past and fascinating relationships with the many different kinds of people (of different races and species) in her life. She is a member of the Hawks, a special sort of law enforcement agency that helps maintain the peace in a world in which very different cultures live side by side. In this installment of the series, Kaylin finds herself investigating a strange series of occurrences involving sudden magical happenings. Charlatans are suddenly able to do what they've been promising, for example. The oracles are predicting a dire future, and when the sky starts literally raining blood, Kaylin finds herself thrown into the middle of a perilous situation that involves saving the world. I continue to enjoy this series, both for its engaging characters and strong writing. It is also refreshing and different, with premises that are unlike those of any other fantasy novels I read, and the plots can be depended on to veer into new and unexpected territory. I'm glad that I'm only halfway through the series!